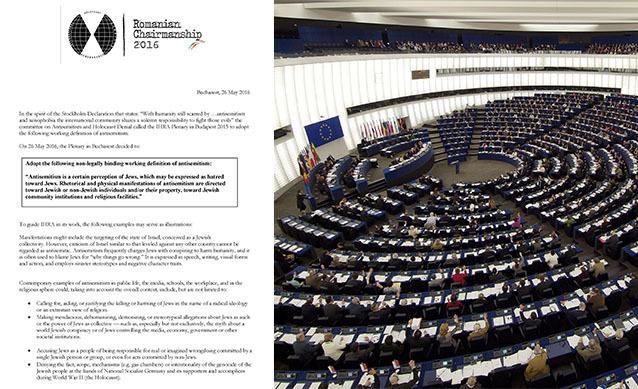 The European Jewish Congress (EJC) applauds the European Parliament for passing a resolution endorsing the International Holocaust Remembrance Alliance (IHRA) working definition of antisemitism and calls on EU member states to adopt and apply the definition. In May 2016, the IHRA, an intergovernmental body comprising 31 countries, eleven observer nations and seven Permanent International Partners, adopted a definition of antisemitism in order to protect Jews from “rhetorical and physical manifestations of antisemitism directed toward Jewish or non-Jewish individuals and/or their property, toward Jewish community institutions and religious facilities. So far, only the UK, Austria and Romania have legally adopted this IHRA definition. Finally, we would like to express our deep gratitude to the European Parliament Working Group on Antisemitism (WGAS) Chair Juan Fernando Lopez Aguilar MEP and Vice-Chairs Cecilia Wikström MEP and Heinz K. Becker MEP for having jointly proposed and pushed for this resolution to be adopted by the European Parliament.